That video was shot exactly one year ago today. New Years Eve 2010. Wow. What a year this has been…! As I type this, there’s only 30 minutes left of 2011 and I’ve been thinking about this last blog post of the year all week. There’s a million things I want to say, but I’m having a difficult time trying to put them all into words. I want to publish one last post in 2011 so I’m going to postpone the other ideas I had for this post (for now) and just try to sum up how I feel tonight; exactly one year from when I recorded the video above. Baby Noah...one year ago. It was love at first sight. I’m in awe of God’s grace and kindness towards our family this year. In complete awe. On Dec 31, 2010 my wife and I just celebrated Noah’s 2 week birthday. It was a wonderful, joyful day…but we were more scared than we had every been about anything in our life. Ever. Let me explain. We learned that our son was born with Down syndrome four hours after he was born. We never saw it coming. We were completely blindsided. A few days after Noah’s birth my wife and I walked back into the through the same door we had walked out of just a few days previous as we headed to the hospital to welcome Noah into the world. Never in a million years would we have thought we’d be walking back into our home with our new son…..who also happened to be born with Down syndrome. Talk about the surprise of your life. 🙂But it was ok. We loved Noah with every once of our being. We were excited. We were nervous. We were scared. We were confused. We were hurting. We were joyful. It was as if we were injected with every single emotion a person could feel (and some I didn’t even know existed.) It was a very odd feeling. But out of all the emotions we were experiencing, there were two that always rose to the top: love and pride. We loved Noah. And we were proud of him. Noah's getting some Face Time grandparent love! …I’m more scared than I’ve ever been. I am nervous, anxious, and many more things. I want to know my son. I want to teach him about God. I wonder if I’ll ever get to do that now. I’m scared of Noah dying. GA-1 looks very scary. What will we do if he has this? Will there ever be happy days again? Will worry overcome me? Will life ever be normal again? Will my wife be sad forever? Will I? I feel so alone. So worried. The only thing I know to do is pray. I believe God is on His throne watching everything. This is no shock to Him, or to Noah. Today I am fasting. I’m not even sure why. I just want God to know I’m serious. Reggie, his wife, and Brandon are fasting with me. We are begging God for a false positive for the GA-1 test. 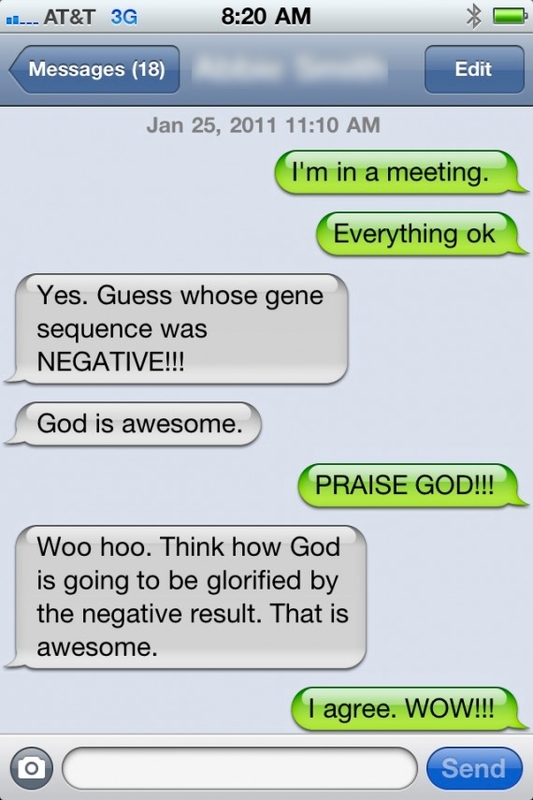 We will praise God either way, but a false positive sure would be nice. I love Noah more than I every thought you could love someone. I feel like my heart is going to explode it is so full. I’m also in deep pain because I can’t “fix” my son. I can do nothing but pray, which is actually the best thing to do. Father, give me peace. Have mercy on Noah, and to us. Please give us a long time to enjoy Noah. He is my son. As a Father your understand the pain of loosing a son. But Father would you spare us that pain! I know we don’t “deserve” that are son get better any more more than any other parents praying this same prayer tonight, but Lord I beg you. I feel like if he has this, my heart will be sad forever. I feel like I’ll worry forever. Although I know you can, and do, give peace to us when we go through something difficult, I don’t want it to be this way. Please God, answer our prayer. Please give Noah a false positive for this test. Either way Lord, please give us peace to walk through this. We are your children, and we are afraid. Please God show your glory through this (which you will do no matter what the outcome.) Lord give me the strength to say ‘thy will be done,’ and the strength to commit my son to you. He is yours, but Lord we love him. Thank you for all of our blessings, and please give us peace and rest. Wow. Just typing that out brought back a rush of emotions. I remember weeping so hard as I penned those words that I had to stop writing a few times. I remember never being more scared about anything in my life before. I remember never crying so hard about anything in my life before. I also remember never praying so hard about anything in my life before. I remember just being honest to God about how I felt, and pleading with Him of behalf of my little 2 week old son. If Noah did have GA-1 I knew that God was the only One in the world capable of healing him, and the only thing I knew to do was pray…..ask every other Christian I knew to pray with me as well. And we prayed hard. Every single day. I never thought in a million years I’d be begging God to just let my son have Down syndrome. But I was. And that is what was gong on in our life this time last year. Heavy stuff huh? In fact we were at the hospital on New Years Eve last year as we watched our 2 week old baby scream as lab technicians stuck him with needles over and over again while they tried to find a tiny, new born vein on him that big enough to allow them to draw blood. After the tests were finished we came home, and I recorded the video I posted above. And we went to sleep scared. Anxious. Worried, and madly in love with a two week old boy. 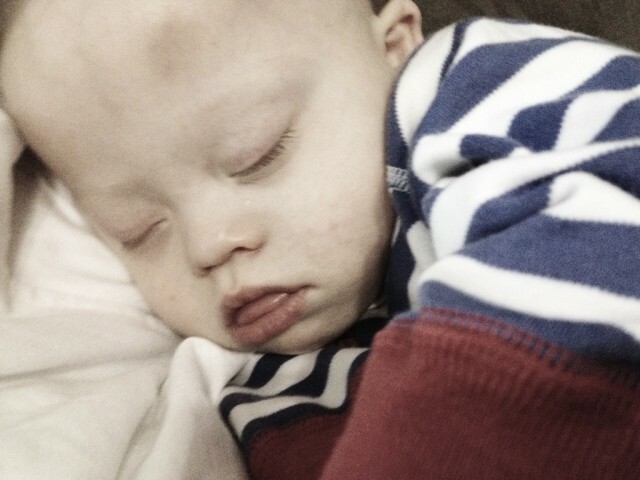 We would just hold him tight and wish that our little boy would just have Down syndrome. And that’s what was going on in our life one year ago today. Pretty crazy way to ring in the New Year, huh? Wanna know what happened? Well…after running all of the tests (including a DNA sequence) we received the results early. And guess what…. This text message was epic! …it turned out Noah didn’t have GA-1, and the original test was a false positive! (At least that’s what the Doctor’s say…..me on the other hand….? 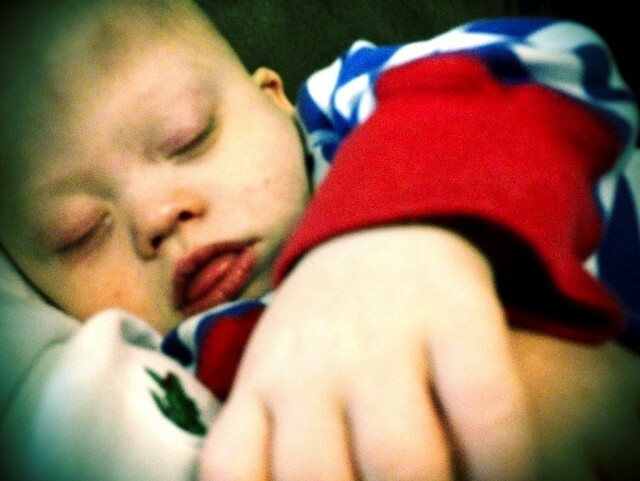 I think God answered my prayer request that my son would just have Down syndrome. 🙂 Guess I’ll have to wait to find out if I was right. It's a year later, and I'm even more in love with this kid! Today I’m almost in tears as I write again. But this time the tears are tears of joy. Pure joy. Tonight I held my healthy,1 year old son as he fell asleep (actually he isn’t 100% healthy tonight…he has a little cold.) As I held him I thanked God for the faithfulness, grace, and love He demonstrated toward our family his past year. He gave us peace when no one else could. This time last year when we were hurting people brought us gifts, movies, food, you name it….but none of it gave us true peace. Only God could do that. And He did. He gave us peace in the middle of our darkest days. I could tell you so many stories about how God worked in our lives during that time, but I’ll just say this. We prayed every night for God to give us peace and joy in the middle of all that we were going through, even when it didn’t seem possible to have peace…..and guess what. He did! A few weeks after I wrote that entry in my journal my wife and I begin to ask each other, “Today was a good day for me, what about you? Did you cry today” and eventually one of us answered back, “Actually no..I didn’t! Wow!” And we realized that God has transformed our hearts. Our fear had 100% been replaced with joy. In fact by the time we received the news that Noah didn’t have GA-1 we were 100% prepared (and ok) with whatever results we got. It sounds crazy. Impossible even. But it’s true. I can honestly say that I now know, first hand, that in our time of need God will supply us with everything we need to get through it. You’ll never think you’ll be able to get through it before you are in it. In fact you may even say (as I did the night before Noah was born) that you don’t think you can “handle” (fill in the blank with your it.) But guess what…when that it comes, you realize that God is bigger than your it. And He will amaze you. And He will cause you to fall in love with Him even more. And you’ll come out of you it saying that it was the best thing that ever happened to you because now your faith is a million times stronger. And the next time something difficult (another it) comes your way you’ll be less worried because you’ll be able to remember the time God brought you through your it. The one tough thing about all of this is that you have to go through your it. There’s no growth, like the growth you experience during hard times. Until you go through something really difficult; I mean something so difficult you’re praying prayers like: “God, I’m scared my son is going to die,” you’ll never fully understand the extent of the growth I’m talking about. It’s when you find yourself at a point of desperation and have no choice but to trust God, it’s there, in that scary place, where the greatest growth and deepest understanding of God’s provision and care for you occur. God has really worked in this little boy's life this year! It’s been a year since that all of that happened and here I am on the other side of it; alive and more grateful than ever. This has been the very best year of my life. Without a doubt. I want you to know that no matter what you are going through, in good times and bad, God cares about you. He truly does. It’s more than just a cliché. More than just a saying. It’s the truth. God not only cares about what you are going through, He is productive. He doesn’t just sit there. He can really give you a peace and joy in the middle of what you going though. Trust me, I know. This time last year all I wanted to do was weep. He turned my weeping into joy. And He can do the same for you. He wants to give you a joy and peace so deep that everyone else in your life looks at you and wonders, “How could they be smiling at a time like this?” Of course, it doesn’t always mean things will turn out the way you want them to. Sometimes we don’t understand the story God is in the middle of telling. And that’s ok because no matter how scary things get, you can always trust in the One that still holds the whole world in His hands. And you can go to sleep at night trusting in the fact that your it is fully, 100% in His hands. That you can cast your cares and burdens onto Him, and He will give you rest. And man….that rest is sweet; trust me. Wow! it’s almost 5:30 in the morning now, which means it’s 2012. Since it’s the start of a New Year how about I offer you this simple, yet life changing, New Year’s Resolution for 2012: Trust God. That’s it. Instead of worrying night after night about all the “what if’s” and it’s in your life…what would your life be like if you (and I) just start trusting God more. Can you imagine how different your life would be if you and I truly lived our life trusting in the fact that God still holds the whole world in the palm of His hand? Can you imagine how great 2012 could be if we lived each and every day as if that was true? The good news is…it is true! Let’s start this year off right by committing to trust God in everything this year….even the really scary stuff. Are you willing? It won’t be easy. But it’ll be worth it. How about taking a few minutes to pause, and ask God to help you commit all of your worries, fears, and anxieties to Him this year. Are you up to the challenge? Be sure to let me know in the comments! Here’s to a great 2012! Though my 10 month old son doesn’t have Down syndrome, I came across your blog when I was trying to find out the average time intervals between crawling, cruising and walking. I read your post about the Leukemia scare and how traumatic it was to hold your little boy down for the blood draw. Perhaps you are familiar with it already, but if he has to have blood drawn routinely, you should consider using Emla cream to numb the area. My little sister has hypoplastic right ventricle, tricuspid and pulmonary atresia and had to have her blood drawn often from the time she was an infant and the Emla cream made it so much less traumatic. (Though at 25 years old, I don’t think she uses it anymore:-) ) I too know it’s traumatic to the parents…even his vaccines. We have a new pediatrician…we were fired by our old one. she made a crazy misdiagnosis that made no sense (said it was tethered spine, after I took him in because he was falling more and crying when I laid him on his back, despite the fact that he was moving his neck more than ever, crawling, and pulling himself up. It was obvious to me that it was positional rather than postural. She wanted an MRI of his spine, which would require sedation and I felt it an unnecessary risk, so we didn’t have it done. Plus, he had just gotten over a cold and I felt it was related…. my father in law is a neurologist, and pulled strings for us to see a pediatric neurologist who agreed the diagnosis made no sense and said it was probably vertigo that would go away on its own and sure enough, it did….She also said at every well check that it’s a waste of time to see the pediatric cardiologist for his murmur….that he was fine, despite the family history of congenital heart defects ….finally at our seventh month check up, I said “you have to understand where we are coming from….my sister’s pediatrician said the same thing, and had my parents not acted THAT NIGHT she would have died. Lol, our ped quickly brought in the referral form, and it turns out he has mild pulmonic stenosis (which I aoooooo hope never has to be repaired! )…but I later got a letter saying they “have become uncomfortable with our patient-physician relationship.” Lol we were uncomfortable too after all that, and we just had fundamental differences in things like breastfeeding and cosleeping, and we already had a new one picked out. I just wish we fired hem before they fired us! Ha!) I’m thankful the new ped lets me nurse him while he gets his shots…I think it’s less traumatic….previously we got them done at the health dept and they made him lie on the exam table with his legs pinned between the table and the nurse’s body. Of course blood draws are more painful than vaccines and I know many times little kids have to be poked more than once. I never imagined how much it would hurt me to see my baby hurt! Lol not sure why I rambled on! I love to read your blogs…Brings back so many memories of my fears and the unknowns..And I can tell ya that the love you have for Noah will just keep growing..The bond I have with my son Mathew is amazing!! !Mathew is 18 now and I thank GOD everyday for letting me be his mom. Thanks for the kind words Tracie. We do indeed love this little boy beyond words. So glad to here about your son Matthew. You sound like an amazing mom! Thanks for your honesty. Trusting God is easy during the good times, but it is most real when we don’t know the outcome of our faith. Thanks! Thanks again, Noah’s Dad! I have appreciated your blogging throughout these months, and may God continue to be honored and glorifed! I understood everything of what you wrote, having gone through the exact same emotions when Candice, my first child, was born. At some point, I would love to share my book with you, FOR THIS CHILD I PRAYED, which was on Amazon for awhile. It is an account of my journey with her, though she is now in Heaven thirty years. (Unbelievable the passage of time when in my heart and mind, it is as fresh as yesterday!) It has been a continual journey, though, as I share my book constantly even now!! Her life still touches hearts, and that is what counts for eternity! I would be thrilled to send you a copy…. Thank you for sharing your story! I truly believe God had a hand in your story and in all of our lives! I know he has blessed us tremendously and helped us through many difficult times! Thank you so much for the encouraging words. It’s been our honor getting to know your family as well. I look forward to getting to know you guys even more in 2012! I hope you guys had a great New Year! Thank you for giving us the gift of your story, your faithful walk, and the encouragement through Christ. I read your entries, comments, and video posts daily, and it continues to be a serious and thorough resource as our family raises a wonderful precious son who happens to have DS. On June 14th, this was the furtherest path from our lives On June 15th, 2011, it is our only path and one that I wouldn’t change for anything. Praise God and Thank You! Thank you so much for those kind words. It’s great to know that all of the work we put into this website is encouraging people. It’s so much fun getting to meet all of these new parents that are around the same age as Noah. I can’t wait for us all to meet up somewhere! (Maybe we should all try to plan a fun vacation together some day!) ha,ha..wouldn’t that be fun! I hope you guys have the best year ever this year! Thanks of the kind words, and for sharing with everyone. I just prayed for you and your family. I hope you know that God is ready to make this the best year you’ve ever had in regard to your relationship with Him. Seriously. He’s been ready! Let me know if we can ever help, or pray for you guys! I hope 2012 is the best year yet for your family, and your relationship with God! I agree, it is much easier to have faith when all is going according to (our) plan. The true test? Having that faith to guide you through His Plan. Thanks for sharing your story. I find great inspiration in your posts. Thanks Shelley, I really appreciate the kind words. I hope you had a great New Years, and for the encouraging words! Wow. This post brought tears to my eyes. Thank you for your honesty. I can only imagine the fear you and your wife felt while waiting for the GA-1 test results. Praise God that Noah “just has Down syndrome”. Happy New Year to you and your family! Thanks Anna! We are to. Talk about a load off our shoulders. This New Year was much more calm than last year’! Happy New Year to your and your family as well! Thank you for that post! God is so good and has a perfect plan, which is often hard to see. I love hearing stories about how it’s all unfolding. And the power of prayer! Happy New Year! I have really enjoyed reading your blogs this past year. My son Andrew was born with Down Syndrome November 4th, 2010 (so he’s a little older than Noah). I always look to your site for advice from toys to therapy! Have a great New Year and God Bless your family! Gee, thanks Rick! I had just put my make up on and now I’m going to have to redo it! Thank you for sharing! I truly believe God led me to your blog. It has given me such peace. As you may remember, I am 41 and 33 weeks pregnant. We elected not to have any prenatal testing even though Downs is a real possibility for us. I know God has a plan for this little boy, and watching sweet Noah grow, I know that everything is going to be fine, no matter what. But I’ll definately take your non-worry challenge. I am a born worrier. My little Beckett moves so much, so if he takes a break or falls asleep, I’m suddenly convinced something is wrong. I’ve really tried not to worry, but it is probably the absolutely hardest thing for me to do. Even as a child, my Dad would always tell me not to waste my worry. I know God has it handled, and it’s stupid of me to think He needs any help by me worrying. Anyway, I’m going to try even harder for the next 7 weeks to just enjoy little Beckett inside me, and not to worry all the time. Again, thank you so much for opening your life and your sweet family to us. You make such a difference. I had to stop reading half way through because I couldn’t focus anymore with all the tears streaming down my face. I too remember feeling the same way. When they took Patrick from me to rush him to Children’s Hospital I remember being so scared and just praying to God that he would “Just” have Down syndrome. I knew I could handle a DS diagnosis, but all of the other health issues were overwhelming to me. Well, we’ve gotten through some major surgeries with one left to go. God gives you strength you didn’t know you had. Thank you Rick for uniting all of us parents of DS kids. It really helps to know that you’re not alone. Happy New Year Rick, Abbie, and little Noah!!! Had to stop reading half way through because I couldn’t focus through all of my tears. I remember feeling much the same way. They took Patrick from me and rushed him down to children’s hospital and all I could think was Please God let it JUST be Down Syndrome. I didn’t think I could handle any major health concern. But I did. I did wound care and colostomy care. We made it through three surgeries with one left to go. He almost didnt’ make it but he did, all thanks to God. I want to thank you Rick for uniting so many of us parents of DS kids. It is so comforting to know we are not alone and that Down Syndrome is OK. Happy New Year to you Rick, Abbie, and little Noah!!! May 2012 be the best one yet. I will finish reading when i stop crying. Thank you so much, Noah’s Dad! You are such an inspiration. I hope it brings you great joy to know God is using you in incredible ways. I appreciate this post a great deal. Thank you. Thank you. Thank you. I love this. Children a gift from God. But also our gift TO God. I love how you are so tsrnrpaaent and open. I am also very happy to read that Noah does not have GA-1. I remember asking for almost the exact same thing, when we were told about potential surgeries. Alyson has been lucky to have dodged many bullets. We have had one surgery but it was unrelated to the DS complications. For this, I could not explain how grateful I was. Wow! Thanks so much for the inspiration in your words. I have often prayed to God that all Ross has is DS. We have had bilirubin scares, I.S., the heart surgery, pulmonary hypertension, hearing questions, upper respiratory, now a more unknown type of seizure issue that we are addressing. I saw him take off after his heart surgery making gains in growth then be knocked down with upper respiratory infection. Make more strides then get knocked back by new seizure types. It is the two steps forward one step back syndrome. I have discovered that the most crucial thing involved in raising a child with D.S. is balance. If one thing rocks the boat then other go out of whack and sometimes you feel as though the boat is going to be swamped. Remember all to keep bailing water and never lose faith. Just when you think the boat is going under the Lord hands you a bigger bucket and with hard work and prayer you get through it and the waters calm. Word of advice. Never let go of that big bucket…it is a gift! Noah is so beautiful and such a happy boy. Thanks for sharing the news and your story. There is strength in prayer. God Bless you all and a safe, happy, worry free 2012. Okay, I change my mind….THIS is the best blog yet! It was so moving and so true! We trust in God and know that our life is better off because of our trust in Him. We love our little Enzo and could never imagine a life without him. Yes, it was scary at first (lots of tears) but now, it’s no big deal. We have a new “normal” in our life (if there is such a thing as normal in anyone’s life). We love it and we thank Him for our it! Happy New Year! Thank you for the kind words! It’s amazing when you go through something like this and get to have a front row seat to God’s faithfulness! Thanks for being such loving parents! None of ever know how strong we really are until we face such challenges. Thank you so much. It’s great to be on this journey with so many other amazing parents. Rick, I found this blog the day we got Hudsens diagnosis of Down Syndrome. I cannot tell you just how much it has meant to me these past 3 and 1/2 months. Not only have you shown me that Down Syndrome is ok; you have also shown me what an incredible and extraordinary vocation God has called us to parenting special needs children. I appreciate you, Noah and this blog more than you could know! Thank you for sharing this story. Sometimes it takes hearing about the scary parts too for people to understand what family with children who have DS go through. We are hoping for the power of prayer for our daughter after having some blood work come back abnormal from her 12 month check up. We have to take her to a hematologist at a cancer center now. Just the thought of going to a cancer center frightens me more than words can say. Please pray for our daughter that she only has down syndrome too. I feel like you have taken many of my thoughts and put them to paper (or blog rather) for me. In 6 weeks I think I have felt every emotion to the nth degree. Mostly I feel love and joy and pure elation that my baby girl is finally here an I can hold her and kiss her and play with her. but there is also this deep fear for her health and well-being. I have spent entire nights watching her breathe because im scared of the little hole in her heart. Im scared of her upcoming hearing test. I wonder if the day will come when every single thought in my head isnt consumed by Down Syndrome? Will I be able to ever go online without googling something related to DS? Sigh…its a lot. I hope this time next year Im writing somethng as amazing as this note of yours. Thank you for giving me a space to share my thoughts and feelings with other parents like us. Thank you for continually sharing your life and experiences with all of us. God bless you! Thanks for a lovely post. This reminds me of the 1953 book “Angle Unaware” by Dale Rogers”, which points to the spiritual truth behind what we all have experienced. Grief is part of our human condition and is often accompanied with suffering. Surrender to suffering and we find salvation – accepting life fully and perfectly, as it is. This is grace and why our children are angels amongst us as the path to salvation. Then their is the examples they are in unconditional love and compassion. They draw this love and compassion out of those in their Presence. God is expressed through love, so it is all related back to the source. Our children are amongst us to teach us about love and surrender. Love and accept them, perfect as they are and we will have peace and know amazing grace. Thanks be to God. What a powerful post! We also “caught” ourselves saying if only our little one only had Down Syndrome when he was diagnosed with a very serious heart condition which has now thankfully been surgically repaired so we know where you were coming from on that one!! After NG feeding for 6 months and open heart surgery, Down Syndrome is a dawdle! And now nearly two years on, its like all happened to another family not us at all – if you keep going day by day during the tough times then the happy smiley days will come and there will be no looking back!! Our kids are just inspirational! I just found your website! Thanks so much for your honesty and telling Noah’s story! He is precious! My husband and I have a 5 yr old daughter, Evie and a 14 month old daughter, Lily, who has ds and she is the light of our world along with her sister! We were blindsided by ds as well! We did not find out that Lily had ds until she was exactly a month old! We have come a long way and I would not change a minute! God does not make mistakes and sent her to us for a reason! Having Lily makes me more grateful every day and has brought us closer with God and our walk with Him! Thanks again and love reading about Noah!!! What an angel! I just ran across your blog and have enjoyed reading it. You brought back many memories. I have a son, Rick, who is going to be 21 in April. He blind sided us 21 years ago. He is a wonderful man who has Down syndrome. I also have a young lady who will be 18 in April, Alexandra, who has Autism. We also adopted a young lady, who will be 17 in a few weeks, who has Down syndrome, Autism, Hearing Impaired and some medical and physical impairments. All three are the light of our lives. God Bless you! You have so many wonderful surprises ahead. Please take a look at a website that has TOTALLY changed our lives: hope-future.org. My son sees a neurodevelopmental specialist and is doing 1st grade by himself working on grade-level in every area but math. (btw, I stink at math…) Linda Kane has encouraged us to go SO MUCH further beyond where I ever dreamed Adley would be. He is blowing our minds. I SO DESPERATELY want to get the word out to other parents so that they, too, can have hope for a VERY BRIGHT future for their kids who have been given a “label” that might lead others to expect less of them than they would of a child without a label. I would love to visit with you about the approach to learning if/when you’re interested. I just happened to stumble across your web site today. Well, maybe God led me to it? I am the grandmother of Brennen who also was born with Down Syndrome. Brennen will be 22 years old later this month. This child has brought our family so much pride and joy. Brennen is such an out-going young man and where ever he goes, he makes friends. When Brennen was born, no one had a clue he had Down’s Syndrome. My daughter-in-law received a phone call from the pediatrician that she needed to bring Brennen to the hospital right away for a Echo-cardiogram. It was then that Tracey was told he may have Down’s Syndrome. Just like you said, we never saw it coming and we sure were blind-sided. I worried how his Mom and Dad would deal with this. They were young parents and already had a busy 2 year old daughter. We all worried so that this child also had heart involvement. We waited for the tests to come back. I remember what my son said when all the tests came back. “Thank God his heart is okay!” Both young parents accepted this baby’s condition. They both were awesome parents. Tracey researched Down’s Syndrome and learned all she could. Brennen received physical therapy to increase his muscle tone. Both parents worked endlessly and tirelessly with this baby. They were encouraged to teach Brennen how to sign when he got a bit older. Sadly, Brennen’s Dad, my son, died in a car accident when Brennen was only 2 years old. My daughter-on-law remarried about 3 years later. She married a wonderful man who accepted both children unconditionally. Brennen is blessed with his Daddy in heaven watching over him and his Daddy on earth to help him along life’s way. God has truly blessed our family. Thank you for posting your blog and telling your story to encourage others. God Bless Noah and his family. I have to respond to this post. I stumbled upon your site through a friend of mine who had posted your Target article on her Facebook. My brother has DS and it’s inspiring to read about it all from another family member’s perspective. My brother is 30 now and I’m 28 and although I grew up taking care of him like he was the younger one, I wouldn’t trade a second of it. He’s the most clever, funniest guy I know and constantly is breaking down barriers and surprising us. He had open heart surgery last year to fix a leaky valve and I have to say he made it through the whole thing far better than any of us around him did. He now proudly shows his ‘battle scar’ to anyone who asks and has to say it was a ‘piece of cake’. If only all of us could be so confident and strong. Your Noah is going to grow up to be an amazing person who will keep you guessing (in a good way of course) and make you so proud. Thank you for writing and helping others know that having a baby with DS isn’t the end, it’s still only the beginning. I just want you to know that I am in awe that God chose you and your family to share the joys of raising a son with Down syndrome. I don’t think he could have picked any family more perfect, He knows what he is doing!! I thoroughly enjoy reading all your posts and get many ideas and tips to help raise our baby Noah. Please keep up the awesome job you are doing. Found your blog through a Facebook link to the article about the Target ad. Many years ago, as we were getting to know other families with children with Down syndrome, my older son, four at the time, observed, “The thing about babies with Down syndrome is that they’re cuter than other babies.” I think he was on to something–Ryan in the Target ad is awful cute! My daughter with DS turned 21 two weeks before Christmas. You have a wonderful adventure in front of you, in which you’ll meet extraordinary people, some with special needs, some caring for and serving those with special needs. Thanks for writing. Sharing our stories helps us all. Wow. Just…wow! You ever read something or hear something in a moment that just completely overwhelms you because it is so perfect?! THAT just happened…to me, right now…reading your blog! Thank you, thank you so much! I have had so much turmoil in my heart over the last few weeks because I haven’t been able to make a decision about what the next step is in my life…and in one sentence…one little challenge you helped me more than I can even explain! Happy New Year! Wow this post has brought on a flood of emotions! A good cry is good right? Why did I get so emotional? Reading and feeling your raw emotions? Feeling the Love of God through your words? Seeing the Works of God through your story? Thank you for sharing your life and your Love of God! Thank you for your willingness to share your story, your prayer, your heart! it is amazing how just sharing our stories about how God works in our lives with other can remind us how we are all connected in this life! i same to your blog when a friend posted your post about the target ad on her facebook page…then i kept reading! Noah and I are birthday twins!!!! =) and i have a son who was born just a week and day before my birthday in 2010, so my luke is just a week older than your noah…i always feel connected to parents who have kids the same age as mine. what a precious gift your noah is and he is sooo darn cute!!!!!! God bless you and your family and thank you for sharing the story of God’s unfailing love and reminding us how He takes care of all of His children!! Your blog post is so encouraging. My husband is a youth pastor and we love God with all our hearts but it is painful to be stretched. our first was born with down syndrome and had heart failure at two weeks and surgery at four months. our second had seizures for the first few months that stopped suddenly (we believe God healed her) and our littlest baby was born premature and developed pertussis and pneumonia and was in picu in critical condition for over a month. We wondered if it would ever be easy but now I’m so thankful and I believe that God is already building our childrens testimony’s. Your son is beautiful, thank you to you and your wife for sharing him and your faith. Having had our first child this past August after being married 17 years, my husband and I are seeing more each day what a blessing a baby is. 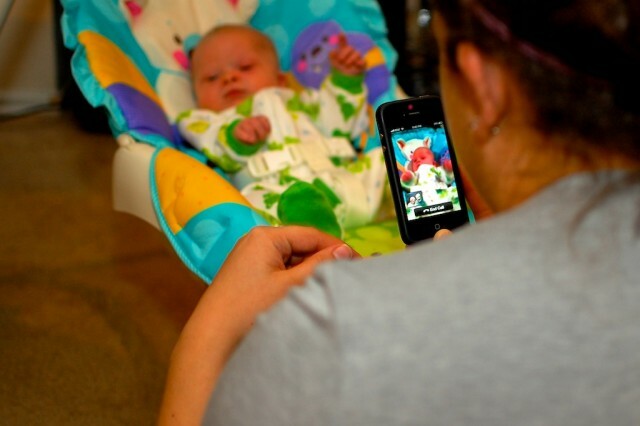 I’m struck by how uncommonly beautiful a baby Noah is – such wonderful photos you’ve taken! Blessings to you for 2012, and praising God with you for the gift of Noah! Wow, it was so uplifting to read an entry that was no doubt led by God. Your love for Noah and your love for God is so inspiring and I’ll be checking in on your blog often. Noah is beautiful and what a joy. I have a son who has Lissencephaly (a brain malformation) so I understand where you are coming from…if you say rare..that’s my son 🙂 Not sure if you have ever heard the old children song The Peace that Passes understanding down in my heart…well I truly came to understand that simple song when my son was diagnosed 10plus years ago. God is good! Thank you so much for sharing your story and may it show the love of christ with so many. Your faith in God is truly inspiring. I am SO in love with Noah! I have friends who were told they’d never have children, so they adopted a beautiful little boy that looks like their clone, when he was just a few months old…guess what? My friend’s sister would shop wheer I worked & kept me updated on my freind’s pregnancy & her faimly. About the time the baby was due I asked if he was here yet, she went pale & just said “uh…..yeah”. I knew something was wrong, so I didn’t persue it. I have a neice that was born with a genetic disorder and she uses a wheelchair and/or walker. She looks different, and currently at age 11 she is 35 inches and 35 pounds, so it’s very evident “something is wrong”. I HATE it when I’m showing pictures or introducing her and a new person sees her & says “Awww. what’s wrong with her?”, usually right infront of her like she won’t understand it! Or we’re out at a store & we’re laughing, playing, she’s showing me something on the computer & a person walks up & talks to me because “she might not understand”. She’s in a wheelchair you idiot, she’s not a cucumer! Heck, her doctors talk to HER, not her parents! But I digress. From my experiences with my neice I knew that no matter what, nothing was “wrong” with my friend’s baby! He was born in the summer, so finally about Christmastime the sister came in & was showing pictures…..it was evident he had Downs. I looked at the pictures and was looking not at the “problem”, but at how SERIOUSLY cute he was! That smile! Those tiny little feet! (I LOVE baby feet!) I think it amazed my friend that the first words out of my mouth weren’t soemthing about “oh, poor thing”, or “what’s wrong with him”, it was about how cute he is, what a head full of hair and the things you say about ANY baby! Adults can be so cruel & stupid sometimes. I’ve been following you on Twitter and subscribed to your blog through Google Reader. Thank you for sharing your life, and your son’s life, with the world. This particular post made me cry. When you spoke of your prayer that your son “just have Downs Syndrome” it really pierced my heart. You reminded me of what is important – And of how much we take for granted. I look at your pictures of your son and watch your videos of him and am amazed. He is such a beautiful, happy little boy who is a blessing. How could you do anything other than love him? My family has been going through a lot lately, so “Trust God” has been my motto for the past four years. Thank you for this encouraging post. I found your blog through a link from a friend about the Target ad. Your son is so adorable! My son is 12 weeks old. He does not have DS but we went through a similar situation with the newborn screening. He tested positive for a metabolic disease that is very deadly. I cried a lot and prayed. Luckily, it was a false positive. Prayer is powerful and God is faithful always. Thank you for sharing your story. Wow, what a powerful and truthful post. A testament to the Lord! Your faith is astounding, and I am glad you sought Him instead of going elsewhere. We knew the second our Dakota was born he had Down Syndrome. I took the AFP and failed it, but my doctors assured me that he would be “fine and normal”. I guess it is that mothers intuition or Gods premonition. But as soon as he jumped out of my womb and I saw his face I knew. I wasnt scared. I wasnt crying. I wasnt worried. I was ecstatic! But then came the faces. The faces of those around me. Then came the tears. Then my husband ran from my side into the bathroom and I could her him violently vomiting. Then came my fear. Why was everyone so worried? What could they see that I couldnt? I started to panic! They rshed Dakota away from me. There had to be soemthing else wrong. I was so scared. I sat tehre by myself in silence in a room, that not two minutes ago, was filled with screams and doctors and family. Then they sent in my mother. I knew it had to be bad. She sat on my bedside, and I could feel the tears welling up. What is it, what is wrong!!! She calmly told me – They think he has Down Syndrome, and I said frantically, what else, what else is wrong, just tell me. She calmly said, nothing, Melanie do you realize what I jsut said, they think Dakota has Down Syndrome. I started laughing hysterically, like a crazy woman who had just given birth… Is that ALL?? Everyone was walking around like thier best friend died! My son has Down Syndrome, – SO WHAT! If that is the worst of it, then SO WHAT! I love Dakota with every ounce in my body, and it was the same feelings, the joy, the hope the worry! I know that feeling and I can feel it just like it was yesterday! I guess I wanted to share a bit of my story – which turned into a rant 🙂 Your blog is amazing, and will go places! Your son is amazing, and will go places! My son is 6 now, and he NEVER ceases to amaze me with the things he can do! What a wonderful and fun ride, God has planned for us. And I do think He chooses parents wisely. WE, my friend, are the lucky ones!! I just cried while reading your story. As both a mom and an occupational therapist, your love for your son tugs on my heart-strings. Noah is a precious boy and is blessed beyond measure to have you for parents. WOW! Such an amazing story. I do not have any children with down syndrome but do not think I stumbled across your blog by accident. I cried reading this years if joy, it amazes me the faith that you had during this life event. Its amazing God found you and your wife worthy of this young man. I will continue to pray for your family :). I am a christian, and thank God for sending his son to die for our sins, when you were.pleading with God for Noah and in your unselfishness thought of how God felt spoke to my heart. Glad she doesn’t need therapy but I am a firm believer in early intervention even if you don’t think she needs it. I am an occupational therapist and Colby has been doing great – reaching his milestones- maybe a little slower but I know we are keeping up better because he is getting therapy. I second everything you’ve said! How are things going with Colby these days? I’m very great full for looking up this site. We come from a small town in New Brunswick, Canada and not a lot of down syndrome cases here. We were the first in about 7 or more years. We are very lucky to have a very healthy, now (Feb.27th) 11 year old beautiful daughter!! She is our world and everything we do is for her. There has been MANY struggles with all we have lived so far. Doctors in the book mode and not able to darn look for the positives, school system that is not at all educated in dealing with children with any disability to ignorant people who don`t have a clue!! We were not very old when we had her (27 & 25)so it was scary and no one to confide in or even understand what we were going through. We have taught a lot of people in all professions and life styles to try and be more excepting in our own little way. Belle has taught even more just by being so loving and forgiving. We will always have ladders to climb but with the love that Belle gives us it will help us conquer them all. Thank you so much for letting us know we are not alone in experiencing the ups and downs we have encountered. Keep up the good work and please stay in contact. Praise God & thank you for sharing! We’ve just found out this week that our baby boy, scheduled to arrive via c-section on Valentine’s Day, has down syndrome. I’ve really had some heart-to-heart conversations with God this week and have struggled with what and how to pray. I really appreciate your willingness to share your testimony. @suzanne Thanks for your message, and CONGRATS on your new baby! I’m sorry for just now replying to this. How is everything with your baby?? If you are ok with it, we’d enjoy seeing a picture. You can post one here in the comments, and our our Facebook wall. http://facebook.com/noahsdadcom – hope to hear back from you. You sound like traffic parents. It’s been 23 years, 3 months and 24 days since experiencing my own set of worries, concerns, grief [grief for losing what we knew wouldn’t be], guilt – at grieving [sure didn’t know or understand the process in those first few days], and many other emotions. The first thing I can remember feeling was the I was losing my dreams for the future – dreams for my son, for me as a dad – I wondered if I would EVER dream again – or hope for something more than just getting through the day. So much more to say on that subject – going in my book, which I am in the process of writing. But dreams do come. And challenges. And accomplishments. I do at times reflect on the first few days after his birth, and know that those concerns were in some cases unfounded. There were other issues not yet foreseen, but today, 23 years later, I wouldn’t wish for a different path for my life – or really, for Carson’s. I do wish I could have made some things easier for him, but I truly have never felt more fulfilled, more engaged as a person – in my own life, as well as my son’s. His birth was a gift, to which I am so eternally grateful. Thank you for intimately sharing Noah’s first year journey – I envy your days and years ahead, with much nostalgia. I really like your story at the beginning of Noah’s life. I know how you feel after having gone through similar things with my great grandson Hunter and his parents, we are together as a family. Families are important at times like this. Thank you so much for your story, and sharing your emotions. Thanks Carole, and thanks for all you share and teach all of us! omg next time warn me that i need tissues thank god he is ok thank you lord for answering ricks prayers and let lil noah just have down syndrome . im still cryin rick but they are tears of joy a year late but still tears of joy thank you for sharing everything you n abby n lil noah goes through . im gonna say it again THANK YOU GOD FOR ANSWERING RICK N ABBYS PRAYERS THAT NOAH JUST HAVE DOWN SYNDROME , THANK YOU GOD . Wow, that brought tears to my eyes just reading it, this coming from someone who doesn’t like to cry, although i did cry when i found out Josh is a little boy with DS. But I love that boy with all my heart now. So glad things turned out for the best that he didn’t have GA-1, Nosh is such a cutie. Thanks for the kind words! How old is your son by the way? i think my it was being told i had a 50 percent chance i would have a baby with downs.. i was in denile.. i didnt want to believe it but in my heart i knew i would..having the this lady doctor tell me almost everytime i went to her office that i should have a amino and i didnt want to… telling her 500 or more times no… and dreading going to her office.. it was bad for me… then after my lil abigail was born hearing the nurse say she was a perfect baby.. then seeing the look in the doctors eyes… me knowing something was wrong… then them telling me she had downs.. and then me or my family not actually seeing it.. i never seen it in her…all i saw was a “perfect baby” cuz in my heart i knew.. i think the thing that hurt me more was when they had to do the blood test.. to confirm it, seeing her thru that window.. and them not finding a vain or having trouble with it .. her screaming and me not being able to do crap about it… them sending out another doctor to do it cuz they couldnt… made me feel like it was my fault for not having the amino.. but im over it…id rather did it the way i did cuz aminos scare me.. no way would i want to take a chance in having a miscarrage and it be on my hands that i did it..then we went to the riley hospital cuz she could have had a hole in her heart… and yes she ended up having one… a med sized hole…each time we would go back and she was a trooper our abbie…hopeing that it was healing then one day when we went back they told it it healed all by its self.. thats a true miracle!!! and i believe they exist now!! but its was like a ton of bricks no more worry… just a healthy lil girl!!! God answers prayer. He certainly answered yours. God’s blessings. Every time Timothy had stomach viruses we worried because he had to be hospitalized every time and it happened often. He has finally outgrown these episodes. However this winter he did get it again after a 10 year reprieve and had to be hospitalized again. He pulls his IV’s out. That is not good. He is stubborn. He lets them put it in but when they try to put the tape over it to secure it he reaches over and yanks it out. Every time. More about that later. Thanks for sharing that it brought me back to when we were told and the way I was told. I was full of the same feelings. Your story has been great for us! There’s been alot of scary days. Gabriel has several things. But last November set us on a course of extreme fear and stress. We are yet to emerge on the other side. Gabriel had a diagnosis of Conrail tracheal stenosis by way of long segment complete tracheal rings. Most Children’s trachea does not grow (especially not long segment). Right note most of his trachea is 6mm (newborn size). Gabriel is 22 months. One part of the trachea is 3mm. He’s increasing daily in his difficulties breathing, through stridor, wheezing, upper respiratory illnesses. We are on 5 respiratory meds, and very high dose reflux medicines to try to get his reflux under control add it is interfering with his breathing as well as damaging his esophagus. We were told surgery is the only ready to fix it and there is a 50 percent mortality rate should we undergo the surgery (either during surgery our in days and weeks afterward). Each day I see more stridor and each day the fear builds. Will I lose him? My scare was when my one and only son was born. It turned out the cord was wrapped around his neck three times and it caused one of his lungs to collapse. Because the other lung had to work harder, it too collapsed. The doctors had to insert tubes into each side of his chest to let the air out of his chest and once they did that, the lungs started to work and heal. 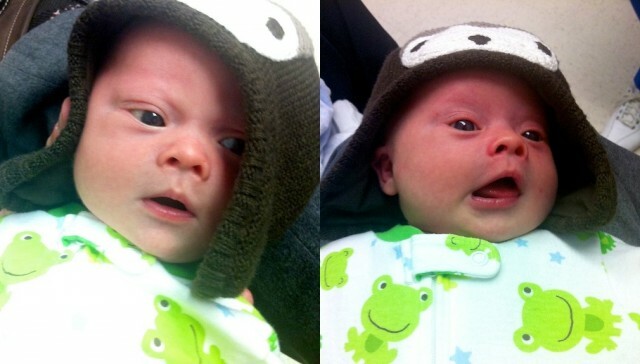 He was born over nine pounds, so he was the biggest baby in NICU. I didn’t get to hold him until he was a week old. He now is a daddy himself of two adorable little boys. Having gone through a few “its” in the past couple years, I can say coming out the other side has increased my faith and made me a much stronger person. God is good, all the time.